Rules for cyclists, including an overview, road junctions, roundabouts and crossing the road. These rules are in addition to those in the following sections, which apply to all vehicles (except the motorway section). See also You and your bicycle. 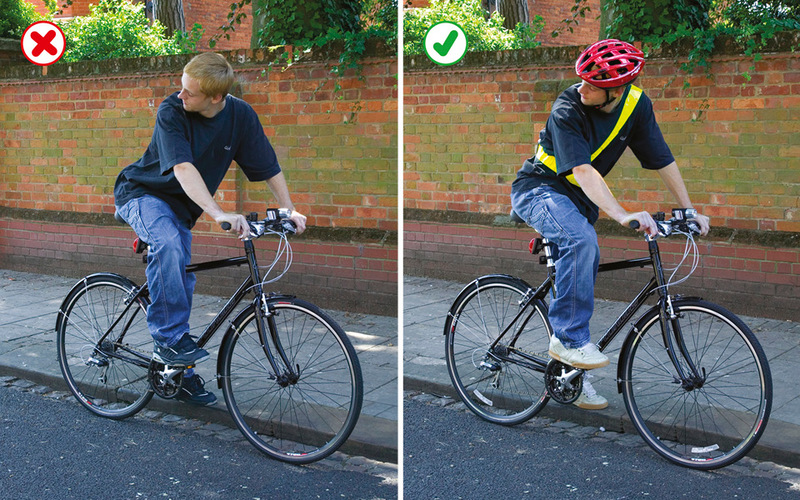 At night your cycle MUST have white front and red rear lights lit. It MUST also be fitted with a red rear reflector (and amber pedal reflectors, if manufactured after 1/10/85). White front reflectors and spoke reflectors will also help you to be seen. Flashing lights are permitted but it is recommended that cyclists who are riding in areas without street lighting use a steady front lamp. Cycle Lanes. These are marked by a white line (which may be broken) along the carriageway (see Rule 140). When using a cycle lane, keep within the lane when practicable. When leaving a cycle lane check before pulling out that it is safe to do so and signal your intention clearly to other road users. Use of cycle lanes is not compulsory and will depend on your experience and skills, but they can make your journey safer. Bus Lanes. Most bus lanes may be used by cyclists as indicated on signs. Watch out for people getting on or off a bus. Be very careful when overtaking a bus or leaving a bus lane as you will be entering a busier traffic flow. Do not pass between the kerb and a bus when it is at a stop. be considerate of other road users, particularly blind and partially sighted pedestrians. Let them know you are there when necessary, for example, by ringing your bell if you have one. It is recommended that a bell be fitted. take care when overtaking (see Rules 162 to 169). Full details about the correct procedure at roundabouts are contained in Rules 184 to 190. Roundabouts can be hazardous and should be approached with care. Give plenty of room to long vehicles on the roundabout as they need more space to manoeuvre. Do not ride in the space they need to get round the roundabout. It may be safer to wait until they have cleared the roundabout. Toucan crossings. These are light-controlled crossings which allow cyclists and pedestrians to share crossing space and cross at the same time. They are push-button operated. Pedestrians and cyclists will see the green signal together. Cyclists are permitted to ride across. Cycle-only crossings. Cycle tracks on opposite sides of the road may be linked by signalled crossings. You may ride across but you MUST NOT cross until the green cycle symbol is showing. Level crossings/Tramways. Take extra care when crossing the tracks (see Rule 306). You should dismount at level crossings where a ‘cyclist dismount’ sign is displayed.